Maxim Ghilan came through the fire and storms of 20th century war to work tirelessly for a just peace. 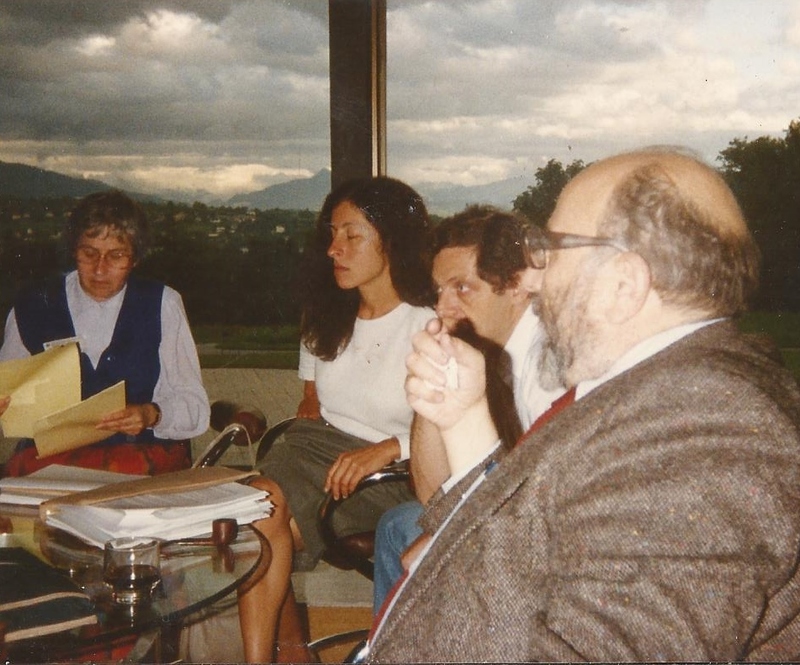 Maxim Ghilan (right) discussing with delegates after a session of the United Nations NGO's conference on the Inalianable Rights of the Palestinian People, 1987 in Geneva..
Maxim Ghilan, who died in Tel Aviv on April 2, was a man who came from the fires and storms of 20th-century war, through hope and disillusionment with the State of Israel, to work tirelessly for a just peace in the Middle East. A former manual worker turned journalist, translator,poet and political analyst, he will be remembered by Jewish Socialists as an amateur diplomat, in Paris, at ease chatting to old printers in a 10th Arondissement cafe or introducing us to world leaders like Yasser Arafat. Born in Lille, France, in 1931, Maxim was five years old when the family moved to Barcelona, for his father's work, just as the Spanish Civil War broke out, in which his father was to be killed by Franco's fascists. In 1944, he, his sister, mother and grandmother went to Palestine, where the teenage Maxim joined the anti-British underground Lehi - the 'Stern Gang' - before serving with the Haganah in the Independence war. Some former underground fighters found difficulty emerging from ideological confusion and adjusting to statehood. Former Sternist Yitzhak Shamir, enlisted by Mossad, rose through its shadowy world of state terror eventually to become Foreign Minister then Prime Minister. Scheib-Eldad became a notorious racist and fascist. Nathan Yelin Mor swung over to advocating Arab-Jewish unity, calling soon after the 1967 war for an Israel-Palestine federation with Jerusalem as its shared capital. Maxim Ghilan was arrested in 1953 in a crackdown on nationalist conspirators. Accused of possessing 'secret documents', he was held for 14 months at Atlit prison. Meeting Palestinian prisoners, he was shocked to witness their brutal treatment by the security police, and began to rethink his outlook. In 1956 he was among 'usual suspects' briefly detained again, after the Kastner assassination. Rudolf Kastner had brought embarrassment to the government by losing a libel action over accusations that he collaborated with the Nazis in wartime Hungary. A police informer was sentenced for his killing. In 1958, Maxim helped form Koach Yotzem, Initiative Force, calling for equality between Israel's citizens, and for Israel to take its place in the Middle East. He joined Uri Avneri, Shalom Cohen and Sabri Jiryis to launch the Israeli Committee for Algerian Freedom, and campaigned against military government in Israel's Arab areas. In 1966, having become editor of an irreverently sensational magazine called Bui, Maxim was jailed again, along with his publisher, for defying the censors to expose how Israeli agents assisted the kidnap of Moroccan trade unionist Mehdi Ben Barka. in France. Ben Barka was tortured to death by Moroccan secret police. When the story was leaked abroad, the Bui case became an international scandal, and famous figures campaigned for the release of the journalists. After working on Uri Avneri's magazine Haolam Hazeh (This World), Maxim came to London where he wrote How Israel Lost Its Soul (Penguin, 1969). But it was in Paris in 1971, with Hungarian-Jewish refugee Louis Marton, that he launched the journal Israel and Palestine, and began his vital work of establishing Israeli-Palestinian dialogue, and involving other Arabs and diaspora jews. The journal became reknowned for thoughtful articles and inside stories rarely found anywhere else, not just on the the Occupied Territories and the Middle East, but on, for instance, Ethiopian Jews. Maxim Ghilan's growing circle included the Egyptian Jewish communist Henri Curiel (assassinated in 1976) and several Palestinians, among them Said Hammami, assassinated in London in 1978. Working for peace was a dangerous profession. Shortly before the 1982 Israeli invasion of Lebanon, Maxim had invited Jewish dissidents from several countries, including members of the Jewish Socialists' Group, to a gathering in Paris at which, as bombs were falling on Beirut, the International Jewish Peace Union was launched. We were cheered to hear that Issam Sartawi and Matti Peled held a joint press conference, and three prominent diaspora Jewish figures - former French president Pierre Mendes France, Nahum Goldmann, and Philip Klutznik- signed an appeal against Israel's war. How much of a hand Maxim Ghilan had in this we don't know. Dr Goldman, former president of both the World Jewish Congress and World Zionist Congress, didn't attend our shabby little gatherings above the Israel and Palestine printshop. But he was not entrusting his concern about Israel and the Jewish future to wealthy and 'important' people. After his death we learned that Goldman had discreetly funded Maxim's work. More followed: public meetings in Paris and UN NGO conferences in Geneva and Vienna. Maxim Ghilan convened and assisted Jewish and Israeli delegations and made sure we met leading Palestinians. In 1987 he was the only non-Palestinian invited to the Palestinian National Council in Algiers, from which began the historic process towards recognising the State of Israel as the price for Palestininian freedom and peace. That the promise has yet to be attained is no fault of Maxim Ghilan's. After the 1993 Oslo agreement, Maxim Ghilan was permitted to return to Israel; threats of prosecution for his 'illegal contacts' were removed on the intervention of then Israeli Minister Shulamit Aloni. Last year he had the sad but proud duty of attending the funeral of a friend for whose return he had fought, Yasser Arafat. Maxim's own funeral at Kibbutz Einat on 8th April was attended by, among others, member of Knesset Azmi Bishara and novelist Amos Kenan. Maxim Ghilan lived neither for riches nor fame, but he left a rich heritage of friends.